So, you want to optimise your Fusion game. You google "clickteam optimisation" and quickly find a lot of threads and articles with many suggestions. But many aren't backed up with actual proven tests or are from many years ago, and so the real-world, present-day implications of optimisation remain somewhat vague. Where should you invest your optimisation efforts most? Does "fine collision" really hurt performance? How much quicker is testing for collisions vs testing for overlap? Will putting all your fastloops in groups be a goldmine of increased framerate, or a waste of time? Often, we just don't know these answers. Or some of us do, but haven't shared our findings with the rest. 1. Contribute any findings you like, about any aspect of Fusion. But please, no hearsay, theories, gut feelings, speculation, wisdom passed down through the generations, or something you're kinda pretty sure was true in MMF 1.5....without some kind of data backing it up. How you test is up to you. You can make a rigorous benchmark and upload results and MFAs. You can use the inbuilt A/B tester in VACCiNE*. Or you can just try out something informally a few times in your own game and write down the FPS. As long as there's some kind of observable result that you're basing your findings on. - Dispute the results....if you can provide countering evidence (screenshot, mfa, detailed description of test, etc.). The more data-points the better! Pay attention to these areas. Even if you have to rework existing code, it may be worth the effort. It's well known that polling for collisions is faster than polling for overlap. I tested this by having 4000 Actives flying around, polling multiple times per frame for collision/overlap. Polling for collision was 797% faster! (184ms @ 1000 loops per frame). Note that this speed advantage only exists if the "on collision" condition is the topmost condition (ie. it's green). Placing it lower appears to make it function like an "on overlap" condition". Checking "antialiasing" in display options of an Active Object - This one is an eyebrow-raiser! I tested the performance impact of the "Anti-aliasing" checkbox under "effects" in the "Display Properties" of Active Objects. To test, I had a few thousand actives flying around, then repositioned them randomly 1500 times per frame in a fastloop. 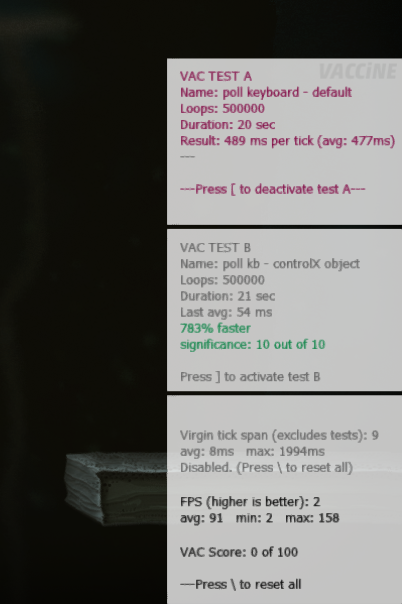 Checking "antialiasing" results in a whopping 64% speed increase (211ms to complete 1500 fastloops). These three numbers (relatively high speed increase, relatively high milliseconds, relatively low number of fastloops), combined with how plentiful Active Objects are in almost any game - make this one of the most impactful optimisation factors I have ever seen tested. This result is remarkable, for a number of reasons. Firstly, let me repeat in case you missed it: turning "anti-aliasing" on gives you the big performance increase. Secondly, as far as I can tell with the naked eye, this setting doesn't seem to do anything - I couldn't see any difference in visual quality with the setting on or off - even after screengrabbing and zooming in Photoshop. Thirdly, from what I could gather after googling old threads, Yves says that the setting is actually misnamed, since in DirectX mode (which I'm assuming almost every Clicker uses by now), it doesn't turn anything on but rather turns Windows' system antialiasing off (though this appears to only make a visible difference to text, as in the String object). Finally, when you create an Active Object, this setting is unchecked by default. So, unless I'm missing something, this is the situation: The "antialiasing" option does nothing at all except substantially impede performance, yet is set to do this by default on every new object you create. It's misnamed in such a way that users desperate for more performance will be inclined to uncheck it, inadvertantly worsening their performance. And, as if to make things as unhelpful as possible, the in-editor description of this option offers this advice: "..."
I'd be very interested for others to chime in about this one (with their own tests and/or info about what this setting actually does). Perhaps I've made a stupid mistake somewhere and missed something. Or perhaps it works very differently on other exporters. Or maybe it really is as terrible as it seems, and we should all be religiously turning it off (ie. checking the box) every time we create an Active. UPDATE 9 May: This one has proved to be highly elusive. A couple of people tried tests on their PCs and saw no difference between AA on and AA off. 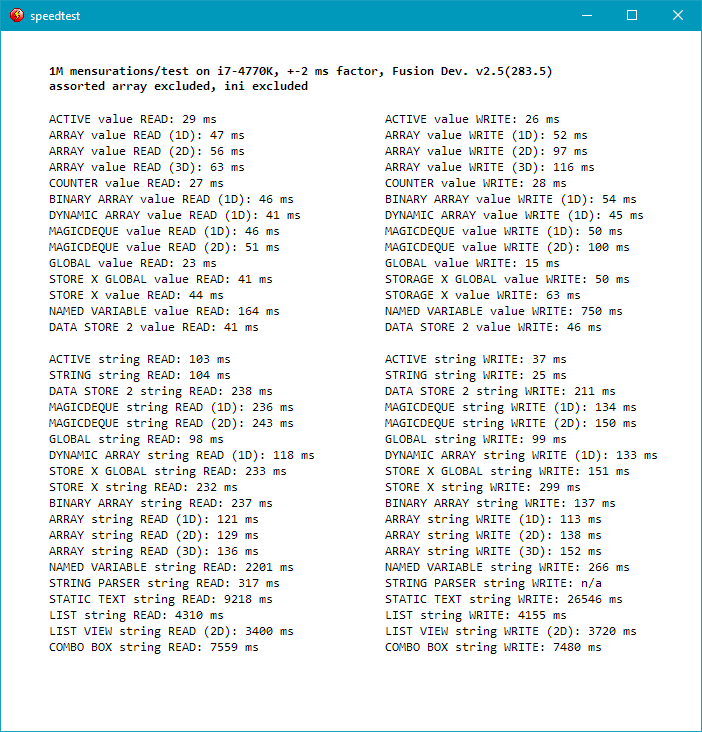 I myself spent a few hours trying to recreate the test and result (I stupidly didn't save the MFA the first time), and I can no longer find any performance impact either. I'm putting this down to a nvidia driver change I made a few days ago. At least one other person (happygreenfrog) has reported a sizeable difference when testing this setting. So, it seems that this setting can make a difference, but only in particular cases, perhaps with particular hardware/driver configurations. My recommendation would still be to check antialiasing, because there's a chance it might have a benefit for some of your players. And I've not seen any evidence (either in reports on this thread or in my own tests) that checking antialiasing hurts performance. Instead, it seems to either do nothing in some cases while improving performance in other cases. I did a few different tests here. For example, I had a few thousand actives flying around, and tested repeatedly for collisions. Or I tested repeatedly for overlaps in a fastloop. I tried round shapes, and wonky irregular shapes. In each case, the results were highly unpredictable. Sometimes they would show a substantial win for "fine detection", while other times it would be the exact opposite. After probably about 20+ tests, the results seemed to slightly favour "no fine detection", on average (maybe about 2%?) So I'm putting it in the "significant" section, though I find the wildly fluctuating results puzzling. I've read a few times that you should put fastloops in groups, and activate/deactivate those groups only as needed in runtime. Every fastloop call must search through all fastloops, so hiding unused ones in inactivated groups speeds this process up. I tested this by running a small handful of fastloops, 2000 times per frame. In test B, I repeated this while also inactivating the vast majority of my game's fastloops (500+ fastloop events referencing 60+ individual fastloops) by closing their groups at the beginning of frame, and reactivated them at the end of each frame. The results were impressive: hiding the fastloops gave me a 179% faster result (30ms). Performance gains in benchmarks like this almost always become less noticeable when you shift from testing conditions to less extreme, more real-world levels. This is because performance discrepancies are exposed and amplified by the stress-testing of a benchmark environment, but are more likely to be camouflaged by everything else going on in the game when brought down to regular levels. However, when I lowered this test from 2000 loops per frame to 200 loops per frame, the result was still a 50% measured speed increase, and when I lowered it further to just 50 loops per frame, I still got an 11% increase! These are solid performance gains at real-world levels. Leave unused fastloops open at your own peril! Someone asked in another thread whether using a single large active as a background would be better or worse than splitting up the same image into lots of tiny actives that would then be pasted into the background. I tested this. Test A used a single 2048x2048 Active. Test B used 4096 little 32x32 Actives (which cover the same area) pasted in the background. In both tests, I rapidly moved the camera around many times per loop in a fastloop, to force Fusion to frequently have to redraw everything. According to the results, the single Active was 35% faster (114ms @ 150000 loops per frame). Say you want to set the value "jump" to 1 when the user is holding space, and to 0 when the user is not holding space. There are two basic approaches to achieving this. Both approaches will produce identical results, but Approach #2 is faster (89% faster according to my test). What approach 2 wastes by always executing the first action (even when it will be immediately overwritten by the 2nd action) it more than makes up for by not having to execute two conditions each time (forcing Fusion to poll the keyboard twice per frame instead of only once). This is a very simple and valuable technique to use in your games. And because you're bound to have plenty of opportunities to use it, it may stack up into some tangible performance savings. However, the performance impact of this technique will vary widely depnding on the circusmtances. In the above example, polling the keyboard (using the default mouse/keyboard object) is expensive, so Approach #2 wins easily by polling fewer times. But if your condition does something less expensive, like checking an alterable value, your savings won't be as large (38% according to my test). Furthermore, the actions will impact on result too. Our example uses a very simple action (set "jump" to a number), so it doesn't matter much that it's sometimes executed unnecessarily. But if we had 10 actions, some of them dealing with complex equations or expensive extensions? Then the cost of sometimes unnecessarily executing those actions might well outweigh the savings of executing one fewer condition. So my advice is to use this always+condition technique frequently, but not unthinkingly. I tested a condition and an action that contained equations referencing the same Active Object several times (eg. Alterable value ("Fred") * 2.5 * Alterable Value B("Fred") / Alterable Value C("Fred")....). I compared this to an otherwise identical event that referenced multiple Actives Objects (eg. Alterable value ("Fred") * 2.5 * Alterable Value B("Barney") / Alterable Value C("Wilma").....). The homogenous Active event was 10% faster (144 @ 1 million loops per frame). This performance increase is small but could potentially accumulate into something significant over a whole project. It's a good argument for storing your variables in 'storage' Active Objects that you created for that purpose, and trying to group those variables contextually, to minimise mixing and matching of Actives (eg. put all your movement-related values in one Active, all your enemy-AI-related values in another, etc.). Moreover, it's also an argument for using global values - especially considering globals' inherent speed advantage (see next post)....though I personally still prefer the neatness and easy accessibility of Actives. If you do all of these things, and do them religiously, they might just amount to a tiny noticeable performance increase...but quite possibly not even then. My advice: you may want change some small habits to accommodate some of these things, but don't waste any significant energy worrying about them. It is said that multiplying is quicker for the CPU than division. And my tests suggest that that's true, but barely. Multiplying tested 2% faster (114ms @ 1 million loops per frame). My advice is to opt for multiplication where convenient, but don't go out of your way. Computers are said to be quicker at comparing things to 0 than to other numbers. In my simple test (test A: is blabla("Active") = 0 | test B: is blabla("Active") = 2) this appears to be the case. But the difference is minimal (comparing to zero is 2% faster: 34ms @ 1.5million loops per frame). Sin seems 2% faster (45ms @ 800000 loops per frame). If all you want is any old curvy wave, then you might as well choose sin over cos.
My tests revealed flags (conditions and actions) to be 18% faster. But the numbers are so miniscule (76ms VS 93ms @ 4 million loops) that I doubt you'd see any difference in anything but the most extreme bottlenecks. I'd personally stick with Alterable Values for their numerous other advantages, except for special use cases where flags really work for you. There are at least two ways to easily 'toggle' an alterable value. One method is to initially set an Alterable Value to 1, then set Alterable Value("MyActive") to Alterable Value("MyActive") * -1 (the result will alternate between 1 and -1). Another is to initially set an Alterable Value to 0, then set Alterable Value("MyActive") to Alterable Value("MyActive") XOR 1 (the result will alternate between 0 and 1). My tests showed the XOR method to be 8% faster (183ms @ 1500000 loops per frame). So that could be a good alternative to flags - you get some of the some of the speed increase of flags, with none of their downfalls. There are two commonly used methods of 'psuedo-functions' (basically, running a section of code only when you need it): putting your 'function' in a fastloop, or in a closed (inactive) group that you activate when necessary. My testing showed calling a fastloop to be moderately faster than opening /closing a group (7% faster, 55ms @ 1million loops per frame). However, this is pretty much a moot point since, as shown earlier, fastloops should be combined with opened/closed groups anyway. In this case, the delay introduced by opening/closing a group once per frame is likely to be far outweighed by the benefit of the fastloop inside not needing to be searched every single time any other fastloop in your game is called. There are a couple of easy ways to tell an event to only execute, say, every 7th frame (or 2nd, 4th, or 100th...). One is to make a counter and always add 1 to it and then make a condition that says if counter mod 7 = 0. Another is to use the TimeX object. The mod method tested 4% faster (46ms @1 million loops per frame). These things appear to make no difference at all - or such a microscopic one that even a stress-test couldn't expose it. I did a similar test to the one above (lots of active objects on screen, rapidly being repositioned in a fastloop). I tested it with objects whose graphics were comprised of PNGs that I imported in the graphics editor. Whether I imported 8 bit PNGs (256 colors), 24 bit PNGs (16M colors) or 32bit PNGs (16M colors + alpha channel), it made no noticeable impact on the test result. In each case, the test took 100ms to complete 1500 fastloops per frame. Keep in mind that the RAM consumption of these different PNGs would almost certainly have been different. But memory and speed are two very separate issues, and what I was measuring here was speed. As far as speed was concerned, there was no difference. They say forEach loops are faster than fastloops, so I wondered whether using a custom fastloop player movement would be faster using a forEach loop (even though there's only one player object, which goes against the traditional use case for a forEach loop). I converted the fastloop Y movement in my game to a forEach loop, and executed it thousands of times per frame (using a fastloop to trigger the forEach loop thousands of times). It was much faster than doing it using my regular fastloop movement - up to 500% faster in one test! Then, to make sure, I created a new custom fastloop movement in a new MFA. I kept it very simple: on each loop, it would move 1 pixel, backtrack 1 pixel if overlapping a backdrop, and then save the X position to an alterable value. I tested this movement using both a fastloop and a forEach loop. This time, the fastloop was much quicker - up to about 180%. I thought that perhaps the problem was that this new MFA had very few other Active Objects in it, whereas the fastloops in my game had to search through hundreds of other objects each time they ran. So I created a couple thousand new actives (about half cloned, half duplicated), but that didn't change anything (other than very slightly slowing down both the forEachloop test and the fastloop test). So, I don't know what to think. Looking through the code, and trying a few variations, I couldn't see why fastloops would be much faster in one scenario and much slower in another. I hope that some more people test fastloops VS forEach loops so we can shed some more light on this. 2 years ago, tompa uploaded a fantastic MFA that compared a whole bunch of different methods of reading/writing variables. Below are my results using this MFA in Windows 10, on the latest version of Fusion (R288.3 steam*). To see tompa's original screenshot, and the mfa so you can test yourself, visit this page. -Certain other types of variable storage have the power to tank your performance big-time (eg. Static Text object is over 1000 times slower than String object. Ouch!!) . Be careful with them! Volnaiskra you're a gem for this community. Always helping fellow Clickers out, creating additional stuff (control, camera) and then putting together testing like this. Hats off! I should have those added in the test somewhere. now I have to go but I'll come back editing this post with those findings with detailed data/proof. or rotating a stretched object (say, a line) towards a far coordinate on screen. plus it has a (simple, but not undesireable ) sort of encryption when saved. consider "nesting" multiple values in a single integer. to avoid expanding step by step, this would result in a dramatic performance loss. running the loop would take about 250/300 times more than if the array had 50000 X dimension at start! This is because in first scenario the array is expanded 50000 times vs none. List objects are awesome, and super useful in most of your projects. id - like thousands times faster! Using a list object as a database takes huge benefit from unchecking "vertical scrollbar"
a list with vertical scrollbar enabled is 25 times slower when adding a line! Lowering framerate (particularly in mobile ports) can result in a game-changer. Consider if your game really needs to perform 60 times x second all those operations you are telling Fusion to perform in the event sheet. human eye will be tricked more than enough from 30 frames x second on. A bit on the same argument: it's easy to code something that happens "always" (with a "always" event, or simply with a condition that always returns true) >> and so those framerate times x second. A little trick I often benefit from using is making those operations happen in specific moments of the frame, and splitting tasks across a reasonable time-frame. always >> add 1 to "frame_count"
And the same goes for schrodinger! Awesome info, thank you very much for posting! Also, this sounds like something Clickteam should consider fixing... Volnaiskra, how about putting up a report in the bug box explaining why the anti-aliasing setting's behavior should change so it's easier to get this super-awesome performance? Just checking- for the "Anti-aliasing" setting, keeping it OFF has a positive impact on string display, but no discernible impact on active display? And the opposite- turning it ON has a positive impact on active performance, but no discernible impact on string performance? Therefore, it is recommended to turn it ON for actives and OFF for strings? @hgf: I'm so pleased! It's incredible isn't it? I am tempted to report it to the bugbox, but I'd like to learn more about this setting. The whole 'big performance increase with zero drawbacks' aspect has a 'too good to be true' feeling about it which makes me slightly uneasy. Like maybe there is some hidden cost lurking somewhere. @advaith: to my knowledge, everything you wrote is correct, except for the bit about it having no performance impact on strings. I haven't actually measured the impact of performance on strings, though I assume there may be some. But as for the rest, yes: leaving anti aliasing OFF hurts performance in actives, has no visual impact (that I can see) on actives, but does have visual impact on strings (it actually enables anti aliasing, paradoxically). And conversely, turning anti aliasing ON improves performance in actives, has no visual impact on actives, but has visual impact on strings (makes them jaggy, paradoxically). Though all this may be different on different runtimes, non-HWA (non-directX ) mode, or when other factors are involved. Hopefully others can weigh in with more info on this.